I recently had the opportunity to preview “Ambassador Slang” from Rakaa Iriscience’s (Rakaa Taylor) upcoming hip hop solo album Crown of Thorns. All I can say is that “Ambassador Slang” matches all that I was anticipating ever since Rakaa mentioned it in our interview back in February. The hip hop posse cut features a variety of Asian/Pacific Islander artists including Korean/Korean-American artists Tasha, Tiger JK (Drunken Tiger), Dumbfounded, Tablo & Mithra Jin (Epik High). Here is the lineup of MCs that spit fire on this dope dj honda-produced track (in order of appearance and where they represent): Tasha (aka Yoon Mi Rae) / Korea, Tiger JK (Drunken Tiger) / Korea, Roscoe Umali / L.A. via Philippines, Chiefsons – Big Ryzn / L.A. via Samoa, Chiefsons – Moshpit / L.A. via Samoa, Rakaa – WORLDWIDE via L.A., Dumbfoundead / L.A. via Korea, Tassho Pearce / Hawaii via Japan, Epik High – Tablo / Korea, Epik High – Mithra Jin / Korea, Jay Jaballas / L.A. via Philippines & King Kapisi / New Zealand via Samoa. I can confidently say that each and every MC comes correct on the track! You will NOT be disappointed if you are a true hip hop fan. Trust me. This is a groundbreaking hip hop track full of talented artists, regardless of their ethnic origins. I don’t know that something like this has ever been done before (bringing together artists of these backgrounds) and, if it has, not on this level. Obviously Tasha’s verse is of interest to us and she opens the track with this line, “The track hit the headphones, pen hit the pad, put MCs to sleep like tryptophan.” The rest of the verse is pure fire and just confirms what I’ve always thought about her ever since her days as part of the Korean hip hop group Uptown; that she is a dope rapper and one of the best in Korea (male OR female). As usual, Rakaa’s own verse is dope. One thing I’ve noticed recently is that Rakaa has dropped a few Korean-related lyrics within his rhymes. On “Ambassador Slang” he ends a bar with, “… direct vengeance like Park Chan Wook.” Of course, Korean film fans will know that Park Chan Wook is one of the most acclaimed directors in South Korea and was the director of the “Vengeance” trilogy which consists of Sympathy for Mr. Vengeance, Oldboy and Sympathy for Lady Vengeance. I don’t know about everyone else, but I think it is kind of cool that he would drop those kind of subtle Korean references in his lyrics. I hope the track gets released as a single or, at the very least, as a B-side. I truly believe that if the rest of Crown of Thorns is anything like the three tracks I have heard so far (“C.T.D.”, “Delilah” & “Ambassador Slang”), Rakaa’s album is going to be monumental! Rakaa’s Crown of Thorns is scheduled to be released on 7/20/2010 by Decon Records. For more information regarding Rakaa or Crown of Thorns, please check out Decon Records or Rakaa’s Official MySpace or Official Facebook. 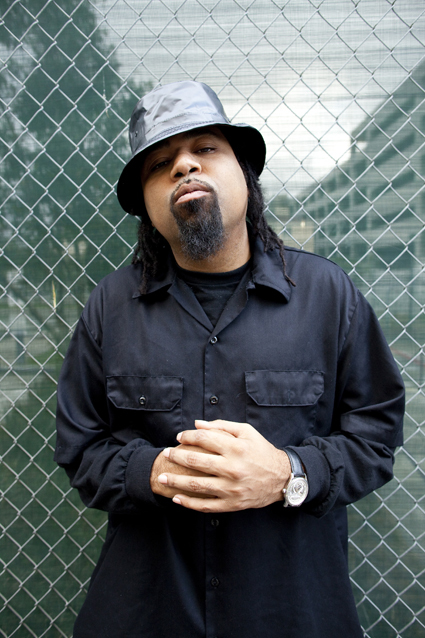 Ayo, you can check out the track on Rakaa’s myspace! THE SONG KNOCKS!